Petrex, a Scottish based Subsea Engineering and Project Management Company has experienced a significant rise in demand for their multi-award winning Visualisation Service. “We have witnessed an unprecedented rise in enquiries as Aberdeen and the North East count down to The All-Energy Exhibition and Conference 2014. We’ve already completed works for clients in the UK, Norway and the Netherlands.” Said Business Manager Ian Pithie. The Petrex Visualisation Service offers 3D animations, story boards, 3D illustrations, 360° pano-photo surveys and design drafting/design for markets such as Subsea, Oil & Gas, Renewables and Product Design. A recent remit was to create a 3D presentation for international Recruitment Specialists, Atlas Professionals. “We approached Petrex with an idea in our head regards a 3D animation that could accurately represent our business area to our broad spectrum of clients. Subsea Designer Kevin Kit Ho managed to combine excellent visual imagery while maintaining our core message and providing something that had the impact we needed. We would not hesitate in approaching Petrex again in future.” Reiterated Darioosh Naderi Account Manager and Technical Consultant for Atlas. 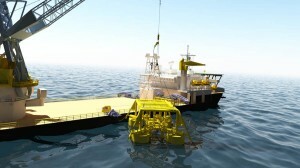 This 3D animation titled “Surface to Subsea” was a virtual Subsea journey incorporating all aspects of operations and highlighting Subsea professions. 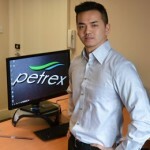 Pictured: Kevin Kit Ho, Subsea Designer at Petrex.